Description: 1129 reverses towards Boston at Andover. Description: 269 arrives at its final stop of Reading. Description: 1129 on the trail of 274. Description: Outbound commuter passing the Lawrence/North Andover town line. Description: Outbound commuter heading in to North Andover at the Lawrence/North Andover town line. Description: Inbound commuter acceleration towards Boston. Description: Lowell-bound 315 pulls out of Wilmington pulled by GP40MC 1129. Description: GP40MC 1129 pushes inbound 318 into Boston. Description: "Screamer" 1012 and GP40MC 1129 idle in North Station. Description: 1129 and 1012 idle side by side awaiting departure. 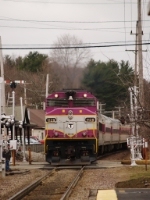 Description: MBTA train P517 stops a Grafton Commuter Rail station with MBTA 1129. Description: Heading into the sunset. Description: Shoving inbound. Someone left the ditch lights on! Description: Arriving at Union Station. Description: A crescent moon hangs over the city sky in the pre-dawn hour at Boston Engine Terminal.